Margaret Hill McCarter crafted an unforgettable story about the pains of human nature and the struggles we all face to fill the God-shaped void in our lives. 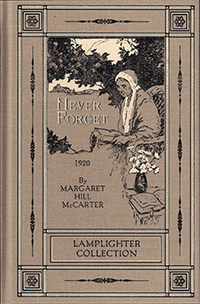 In “Never Forget,” we see the longing heart reflected on each page as men and women yearn to have someone make them complete. Marriage, industry, and children are all blessings from our Father above. It is in the midst of these blessings, however, that our character is forged, as spouses discourage, careers crumble, and children disappoint. Is there something deeper behind the discouragement, crumbling, and disappointment that is forgotten? Once you read this story, you will never forget who will show you the path of life—in whose presence is the fullness of joy and at whose hand are pleasures for evermore. Our second story, “A Night and a Day,” is a drama about a love that makes no conditions and lasts until death. Hesba Stretton tells the tale of a young man named Reuben Hazeldine who sacrifices all for the lives of his friends—even his life. Reuben lowers himself into the darkness of the mines because he believes as Christ laid down His life for us, so we ought to lay down our lives for the brethren. In the last moments of life, despair begins to overpower Reuben’s faith, and he questions not only God’s commands, but His very existence. As he resigns himself to this lonely death, Reuben is determined to leave a message for those who will later find his body. When you finish this story and climb back out of the mine, ask yourself if you would leave the same message. From Shirley Alt of Lychburg, Virginia on 9/11/2018 . Like all the other books I have gotten from you, this one is an excellent read. I love the suspense and the character qualities developed in these stories.